Celestial Bodies: The sun, the moon, planets, stars and other bodies in the universe are called celestial bodies. Star: Some celestial bodies are very big and hot. They are made up of gases. They have their own heat and light. A celestial body which emits its own heat and light is called a star. The sun is an example of star. The light from a star appears to be flickering. This is called twinkling of star. The sun is near to us, so it looks very big. All other stars are very far from us, so they look like tiny dots. You know that things appear smaller when they are away from us. Stars are only visible during night. During daytime, we are unable to see stars because of sunlight. In the night sky, you can see different patterns formed by groups of stars. Such a pattern of stars is called constellation. Ursa Major or Big Bear is one such constellation. Ursa Minor or Small Bear is a constellation which looks like Ursa Major but is smaller in size. Ursa Minor is called Saptrishi in Hindi. There are seven main stars in this constellation. Both the constellations look like ladle and hence are called Big Dipper and Small Dipper. You can easily recognize them by taking help from an elder in your family. You can also locate the Pole Star with the help of these constellations. 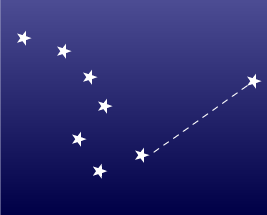 The Pole Star always appears in the north when seen from the northern hemisphere. Its position remains the same throughout the night and never changes. During ancient days, sailors and caravans used the Pole Star to find directions during night. Planet: Some celestial bodies keep on moving around a star. They are called planets. A planet does not have its own light. The earth is a planet. Is huge in size. Much smaller in size. Emits its own light. Planet does not have its own light. Does not revolve around any other celestial body. Revolves around a star. Stars twinkle. Planets do not twinkle. Satellite: Some celestial bodies keep on moving around a planet. They are called satellites. The moon is the only satellite of the earth. Now-a-days, there are many man-made satellites in the sky. These satellites are used for different purposes. For sending signals for television and telephone. For sending pictures of the earth. For sending data about climate. Scientists use this data to make weather predictions. The Solar System is formed by the Sun, eight planets, some other celestial bodies, asteroids and meteorites. The sun is at the centre of the solar system. It is huge in size. It is made of hot gases. The sun provides the pulling force which binds the members of the solar family. The sun is very hot but we do not feel its heat because we are very far away from the sun. In fact, the distance between the sun and the earth is 150 million km. Light travels at the rate of 300,000 km per second. The sunlight takes about 8 minutes to travel between the sun and the earth. Planets: There are eight planets in the solar system and they are; MERCURY, VENUS, EARTH, MARS JPUITER, SATURN, URANUS and NEPTUNE. Till 2006, Pluto was also considered as a planet. But during a meeting of the International Astronomical Union, the scientists decided that it should be considered as DWARF planet. Ceres is another example of dwarf planet. The earth is the third planet from the sun. It is the fifth largest planet in the solar system. The earth is spherical in shape and is flattened at top and bottom. Such a shape is called geoid or earth-like shape. Earth is the only known planet where life exists. Earth has just the right temperature. It is neither too hot nor too cold. Water and air are present on earth. Water is essential for living beings. Oxygen is present in air and oxygen is also essential for living beings. Thus, right conditions are present on the earth to support life. About two-thirds of the earth’s surface is covered with water. Due to this, the earth appears blue when seen from the space. Hence, earth is also called the BLUE PLANET. The moon is our nearest neighbor in the solar system. It is the only satellite of the earth. Moon is 384,400 km from the earth. Since it is so near from us, hence it appears so big; compared to any other celestial body. The diameter of the moon is just one-fourth the diameter of the earth. The moon takes about 27 days to make one revolution around the earth. It takes the same number of days to complete one rotation around its axis. Due to this, only one face of the moon is visible from the earth. Due to this, we get to see different shapes of the moon on different days of the month. Phases of Moon: When the moon appears like a circular disc, it is called the full moon. The full moon day is called ‘poornima’ in Hindi. When no moon is visible in the sky, it is called the new moon. When the moon appears like a sickle, it is called the crescent moon. Sometimes, the moon appears like a semicircle. The full moon appears once in a month. The moon has no water or air. The climate of the moon is very harsh and is not suitable for life. There are lots of hills and craters on the surface of the moon. When you will observe the full moon carefully, you can easily see the shadows of hills and mountains. There are numerous tiny bodies which move around the sun. These are present between the orbits of Jupiter and Mars. These are called asteroids. Scientists believe that asteroids are parts of a planet which may have exploded billions of years ago. Sometimes, a small piece of rock enters the earth’s atmosphere. While entering the earth’s atmosphere it usually burns off. This appears like a shooting star and is called meteor. When such a piece of rock lands on the earth, it is called a meteorite. Some meteorites can be so huge that they can cause deep crater on the surface of the earth. Scientists believe that dinosaurs were killed because of a meteorite. Galaxy: A system of billions of stars is called galaxy. We are living in the Milky Way (Akash Ganga) galaxy. On a clear night, you can easily see a faint band of cloud running across the sky. This is the Milky Way galaxy. Universe: Universe is composed of billions of galaxies. All of us live in the universe. Scientists are yet to estimate the size of the universe.